With a 360-degree swivel seat, babies can easily spin from toy to toy and enjoy all the Baby Einstein activity this baby saucer has to offer. 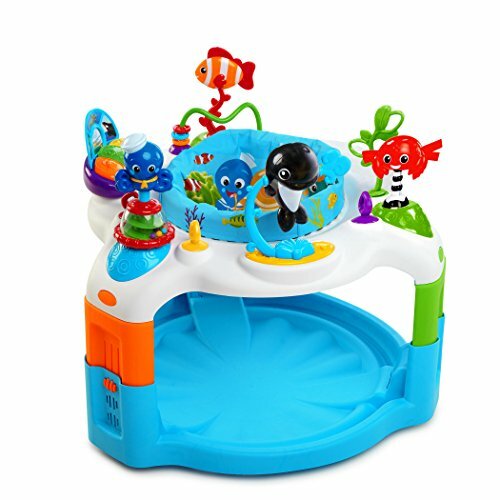 The Baby Einstein Rhythm of the Reef Activity Saucer has ocean-themed activities and soothing ocean sounds to keep your baby captivated, comfortable and content. Little ones love standing tall in their saucer and jumping with joy at their new view of the world. They’ll enjoy exploring a dozen toys and activity centers, like the spinning Orca whale, electronic piano and tropical fish toy. The octopus bead popper and bead chaser will encourage motor skills, while the hanging toys will help your baby with hand-eye coordination. With three easily adjustable height positions, this activity saucer will grow with your baby and their sense of curiosity.